Wow you guys. 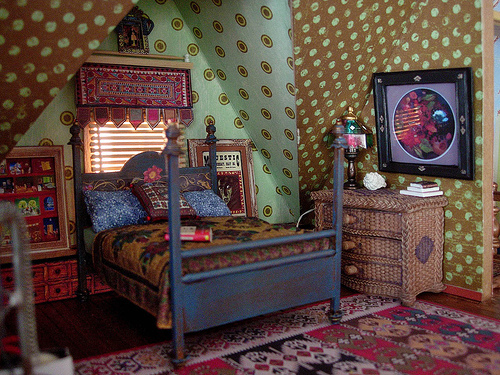 Today I am blown away by this miniaturist attention to detail and bohemian style. Look at all that layering of pattern, style, age. I am in love. Just think of all the time and energy that went into to making these spaces look truly lived in, and yet they are mini! Don't you feel like you have really been in this house? As if it was life size and you were visiting a friend? These spaces really encourage me. They give me a goal as to something I can build up my spaces to be, both in miniature and in scenic design. Frankly this is what I call art! Go check out this artist's flickr and continue to be amazed!